Bow Ties, bowties, bow tie, bowtie, regardless how you spell Bow-ties, at Uniform Ties we carry the bow ties you need for your business uniform atture. 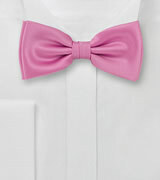 The perfect bow ties for waiters, and caterers. Cheap bow ties for wholesale bow ties orders and bulk pricing discounts. Most of our customers that order bow ties for their employees uniforms are in the restaurant or catering business. There are plenty of reasons why bow ties are common on waiters, restaurant staff, and caterers. First of all, bow ties are very formal looking and are part of the formal and traditional waiter uniform. Secondly, it is much less likely for a bow tie to get dirty when comparing the bowtie to the necktie. Finally, just like solid color neckties, bow ties are available in almost all colors imaginable. At Uniform Ties we always carry the most popular bowtie colors in stock ready to ship, even for large quantity orders. There is no need for your employees to learn how to tie a bow tie. All our bow ties are pre-tied. The length can be adjusted to allow for any collar size. Often times bow ties are matched with a men's pocket square. At Uniform Ties we carry all common colors in stock. Our Bowtie and Pocket Square colors match exactly and are made from the same fabric. Even though bow ties are typically matched with pocket squares of the same color, it is not uncommon to wear bow ties and pocket squares in different colors shades. Example of popular color combinations: Pink bowtie and white pocket square, black bow tie and white pocket square, burgundy bow tie and white pocket square. Do you need to place a large order for your uniform bow ties? Give us a call and check on discounts on bulk bow ties orders. Large price breaks will apply for orders larger than 50 bow ties. Contact us 24/7 and get all the information on bow ties you need, such as: Custom design bow ties, wholesale bow ties pricing, additional color options and designs for bow ties.